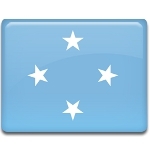 The citizens of the Federated States of Micronesia annually observe Constitution Day on May 10. This is a public holiday. The Federated States of Micronesia comprise around 607 islands, that lie northwest of New Guinea and east of the Philippines. Micronesia consists of four states Yap, Pohnpei, Kosrae and Chuuk. Each state is centered on one or more main high islands. The islands of Micronesia were first explored by the Portuguese, who searched for the Spice Islands (then name of Indonesia), and the Spanish. The Spanish archipelago of Micronesia was sold to Germany in 1899 and following World War I it came to Japan as a League of Nations mandate. Following World War II, Micronesia was administered by the USA under United Nations auspices. The four of the Trust Territory districts ratified a new constitution in May 10, 1979 to become the Federated States of Micronesia. This event marked the emergence of modern Micronesia from trusteeship to independence from the USA. Nowadays all four Micronesian states have their own constitutions and they function independently from others. Every state elects a senator, who serves a four-year term. The Congress is the main legislature, which is elected by popular vote. The Congress elects the President and Vice President of Micronesia.